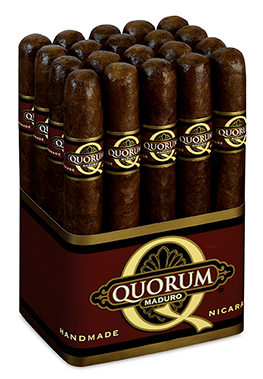 Quorum Maduro cigars are yet another terrific addition to J.C. Newman Cigar Co.'s very popular Quorum line of value-priced cigars, which includes Classic and Shade. The flavorful, medium-bodied Quorum Maduro cigars are handmade at the Torano's Nicaraguan factory with the same attention to detail as more expensive cigars. The Nicaraguan binder and fillers are secured within dark and oily Nicaraguan Maduro wrapper leaf, producing a smooth and sweet cigar with rich Maduro flavor. Quorum Maduros are the perfect everyday smokes you'll always want to have on hand because they're enjoyable and remarkably priced.